High Octane Brands | Far Sighted Media owns interests in a broad range of media, communications and entertainment businesses. Create a cohesive corporate identity for a vastly diversified intellectual property investment entity. Establish corporate and brand identities utilizing consumer research to develop a positioning and plasticity strategy. 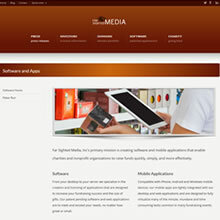 Full service suite utilized in creating the brand's design, marketing, and strategy. A well structured, multi-faceted, web presence that combines brand's many aspects into a singular identifiable entity under one domain.